Posted by Editor at 8:44 PM . 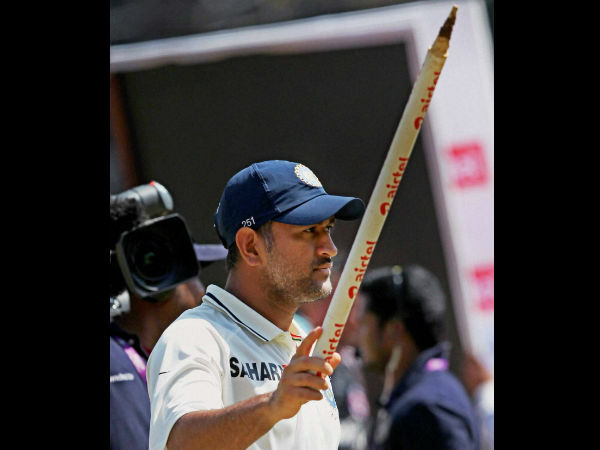 It was Mahendra Singh Dhoni's first double century in Test cricket. More than the quantum of runs it was the manner and the situation in which they were scored will classify it as one of the greatest innings in modern cricket history. The Indian captain silenced his critics with the awesome power of his batting, playing the best knock of his career yet. His sensational knock took the game away from the visitors whose fierce determination was very difficult to overcome. It was a kind of knock that would have made the legends proud. It surely changed the complexion of the game as the Australian captain Michael Clarke conceded in the post-match media briefing at the end of the first Test against India in Chennai on February 26. "They outplayed us. Mahendra Singh Dhoni certainly led the charge and I thought Virat Kohli was outstanding as well with his hundred. But it certainly was Dhoni, who changed the game," the Aussie skipper acknowledged. Clarke admitted that Dhoni's innings had the most impact on the match, but did not forget to praise off-spinner Ravichandran Ashwin, who took 12 Aussie wickets to pave the way for India's victory. "It (Dhoni's innings) certainly had an impact on the game. Dhoni contributed a lot to India's success in this Test match. But like I said, Kohli made a fantastic hundred. Ashwin got seven wickets in the first innings and five in the second. Those were three very good performances. We were completely outplayed," Clarke added. I think there are areas in both teams you need to focus on. There are weak areas in the Indian team we did not attack enough. If we had got 150 or 200 on the board we might have been able to expose or at least see how they played on a deteriorating wicket. A lot of credit has to go to India," he felt. Clarke’s assessment was perfect. India would not have only struggled but, going by their recent record, stood a fair chance of losing the game if they were a target in the excess of 150 in the second innings. Dhoni’s double century provided India the cushion to bowl the Australians out a second time without being asked to get many runs in the last innings of the match. Australia had done exceptionally well to post a first innings score of 380 thanks to a fighting century from skipper Clarke. And they were right on top of the game when Sachin Tendulkar was scalped early on the third day. Enter Dhoni at number six, one place ahead than he normally bats, and the game started changing. His partnership with Kohli brought India closer to the Australian total but another mini-collapse opened up the game. Dhoni’s assault in the later part of his innings blew whatever hopes Australia had of limiting the Indian lead. His dominating knock forced the visitors to spread the field and the tired bowlers came under the hammer. He could have gone on to score 250 but he gloved a bouncer straight to the keeper which, on another day, would have sailed right over the top.